Rap star Kanye West has said sorry for interrupting the acceptance speech of singer Taylor Swift at the MTV Video Music Awards ceremony in New York. 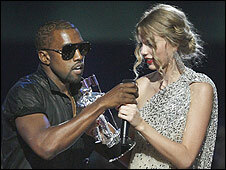 The musician stormed the stage to tell the audience Beyonce should have won best female video prize. Madonna made a personal tribute to Michael Jackson at the ceremony, saying she felt she had "abandoned him" and "felt his pain". The late star's sister Janet recreated the dance moves from their duet Scream. West jumped onto the stage after Swift scooped the award, and said: "Taylor, I'm really happy for you, and I'm gonna let you finish, but Beyonce had one of the best videos of all time." The audience jeered, and Beyonce, who won video of the year and two other awards for Single Ladies, later invited Swift back onto the stage to complete her acceptance speech. West wrote on his blog later: "I'm soooo sorry to Taylor Swift, her fans and her mom. "I spoke to her mother right after and she said the same thing my mother would've said. She is very talented." Madonna, who appeared on stage dressed in black, spoke about Jackson's life lived in the glare of publicity, saying "I had a childhood and was allowed to make mistakes and find my own way in the world." She added that when she heard of his death: "We had allowed this magnificent creature who once set the world on fire to somehow slip through the cracks." The ceremony concluded with an airing of the full trailer for This Is It, the documentary about Jackson's final concert rehearsals, due to be released next month. Other winners at the ceremony, hosted by Russell Brand, included Lady Gaga for best new artist, whose live performance culminated in her pretending to stab herself and swinging from the ceiling. Britney Spears won best pop video for Womanizer, with prizes also going to Green Day, Eminem and TI.